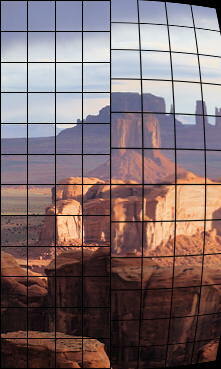 Lens (optical) distortion is an aberration that causes straight lines to curve near the edges of images. It can be troublesome for architectural photography and photogrammetry (measurements derived from images). The simplest approximation is the 3rd order equation, ru = rd + krd3 where rd is the distorted and ru is the undistorted radius. Depending on the sign of k, it can be either "barrel" (shown on the right) or "pincushion." A mixture known as "mustache" distortion may occur for complex lenses which are better described by a 5th order approximation (ru = rd+ h1rd3+ h2rd5) . Lens distortion and coefficients for correcting it are calculated in the Checkerboard module, which calculates 3rd order, 5th order and tangent/arctangent distortion model along with sharpness and several other factors, Dot Pattern performs CPIQ-compliant distortion measurement. SFRplus measure distortion with almost as much detail as checkerboard. SFRplus distortion results are in the Image, Geometry, Distortion, FoV and Radial distortion plots. The Distortion (legacy) module can measure low amounts of distortion from a grid or checkerboard pattern. eSFR ISO measures distortion with slightly less precision than SFRplus. Distortion is worst in wide angle, telephoto, and zoom lenses. It often worse for close-up images than for images at a distance. It can be easily corrected in software. For more details see Distortion: Methods and Modules. Picture Window Pro and PTLens have tools for removing it.